Want to know how to rank youtube video fast? Is it possible your next video will rank no.1 on youtube search results? the answer is YES. Before we step in the tricks you have to know little bit detail about it. lets start. The dynamics of online marketing are changing. What was once driven by blogs and written content is not taken over by videos. People want to consume more content by spending much less time on YouTube. This is why YouTube has become one of the most influential forms of online communication. Not only can you get an audience with your ideas, but you can also make money on YouTube if you experiment a little and go by the book. YouTube is effortless for the viewers, but yes, you will need some in-depth analysis on how the channel works. You must have a good YouTube ranking, before using the medium for business. From using the right keywords for your videos to creating engaging content, it’s a long road before you get the best rankings on YouTube. Before you are guided into how to raise your YouTube rankings, you must understand the primary factors that affect YouTube Rankings. No matter what the newbies in the business tell you, descriptions, video titles, and tags are the ranking factors. Now, Keyword insertion is significant. And you must know where to insert keywords in your videos. Preferably, keywords should prefix or lead the video titles. Ensure you add your social profiles apart from your website links in video descriptions for more engagement. Goes without saying, HD videos rank better for the simple reason that they offer a better user experience. Shoddy videos are more likely to get more dislikes. There are no shortcuts to success. This holds true for YouTube videos as well. A significant part of the story here rests on the concept of Audience Retention. The more of your video people watch, the more it tends to rank. Your video’s total watch time makes a lot of difference. More the total minutes of YouTube watching, the better. Longer videos just mean, your audience on YouTube for a more extended period. The number of minutes people watch your video; the more YouTube will rank in the search results. You post two videos on YouTube. Let’s say that each video gets 1000 views. This just means that on an average, people watched half of your video. And if the total watch time for Video 1 (2-min video) was 1000 minutes, the more extended video’s watch time must be 5,000 minutes. So, the longer video was watched five times more than Video Number 1. This is what makes the longer video rank better on YouTube. But it isn’t that simple after all. This trick works only if your audience stays and watches the video. Now you know that longer videos rank better as they accumulate more watch time. But are you giving your audience the right content to hook on to? How do you ensure that you will keep their attention? You must hook people in the first 15 seconds of the video to maximise your watch time. This can be achieved by using PPP formula. Preview what your video is all about. Don’t go for one-minute intros. The creative bent of your mind will disagree, but this is what sells. People have no time for introductions on YouTube. They want you to get straight to the point. In this step, you tell them what you have accomplished, researched and experienced by using the same tips you are giving them. It could be a case study, a video description of how the tips benefitted you, what you understood after the research, what else can they expect, etc. Give them proof of what their investment is worth. This is usually the most crucial aspect of a video. This preview is not the one you have used before. This preview is more about generating curiosity. Sign off with something that brings the audience back to your channel. PPP formula is the easiest way to target your video and make it sell to your prospective audience. One way to find relevant keywords is to use the Search Suggest feature of Youtube. Just type in a word in Youtube search box and all related keywords will drop down. Look at the example in the image below where we have typed the keyword “create wealth” and related keywords suggestions have come up. These are keywords people have actually used to search on Youtube. Hence these are definitely popular. You could also see the meta tags and keywords used by other popular channels in your niche to understand what keywords work. Once you choose your keywords, it’s time to focus on a few keywords which you would like to get ranked. For this we can use Google keywords planner. Go to Google Keyword planner and click on the first link. You need to have a keyword that you are trying to rank the video for. Once you are on the planner, search for a keyword, look for “Customise your search”. You want some targeted traffic. You want a keyword that at least has 500 monthly searches. Like they say, a low hanging fruit could be a lot easier to score. The lower ranking keywords mean less competition and it’s easy to rank for. You can also look for keywords that have 5,000 or less exact matches on Youtube. How do you find this? Copy your keywords within quotes and you will see the number of results on the right. And the same way you can check it for Google. The results should be 100,000 or less. Find that one long tailed keyword that you can focus on. You can use the rest of the keywords as LSI keywords. These are related keywords that help Youtube understand your content better. If you don’t know about how to research keywords for youtube check this page that have 100+ keyword research tools, you can get more profitable keyword niche here. The days of keyword stuffing your video are long gone. Google and Youtube use your video title to understand what your video is all about. Before you take the time out to create a YouTube video, look for the right keywords that will promise the most number of views. If you don’t get the right keyword response at this stage, you can still tweak your content idea and create new keywords as per the keyword search analysis. You also have a tab that read out “Buyer Intent”. It allows you to filter out the not-so-important keywords that will not generate any leads. These are keywords that tell you what the YouTube video surfer does not intend to purchase your wares. Upon streamlining your keyword research like this, you can work on the exact keywords that promise returns. Note: The YouTube Keyword Tool was shut down by Google some years, and KeywordKeg has taken its place in the market. So, once you know which keywords to use, you must know where to use them. Until a few years back, users would stuff their YouTube videos with all the Keywords that seemed relevant. That doesn’t work anymore. For the simple reason, YouTube and Google are not listening to your video. PRO TIP#1: Youtube has a pretty advanced way of knowing what you are saying in the video. So if you say the keywords in the beginning and the end, YouTube will categorize it. Use the exact keyword cleverly in the title. If you have an exact title with just the right keywords for your video, it will make your content viewer friendly. PRO TIP#2 : What helps more is the description text you use. It should be of at-least 300 words or so. 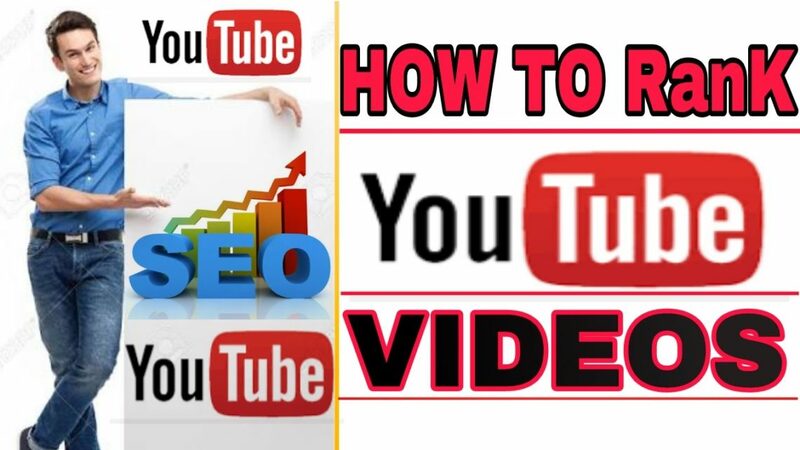 Also, the YouTube algorithm for SEO will help you optimize your video better. If you haven’t thought about it already—make sure your YouTube Channel is not a mess. The easiest way to get more YouTube traffic is by organizing your videos into keyword-rich playlists. These lists give YouTube details about the nature of your videos, and more text-based content is always attracting more views. Step #6. User interaction/ Engagement signals – Shares, likes, comments and subscribers. Ever see those “Do you like this video” signals hovering above the video screen? These are a part of what you call User Interaction Signals or engagement signals. These signs are your way of getting your viewers to interact with your channel. YouTube wants to see that people are interacting with the video. The more people interact with you, the better it is for your video’s YouTube Rankings. Because comments correlate with rankings more than any other engagement signal. Whenever someone engages with your video, YouTube tells people are loving your video. The question is—how do you get people to comment on your videos? You can use simple tactics like asking people to like your video through annotations. Ask your people to subscribe and comment. Use a hyper-specific call to action at the end of your video works best. Don’t use a generic CTA. Give your viewers something specific to comment on. For instance, which of these methods will you use first. When someone searches for something on YouTube, the channel pays close attention to the videos people click on. In that case, even if your video is not among the top three results, but has more views or clicks, YouTube eventually think that the keywords used are the best result for that video. They would want to make it easier for people to find you. And that’s how you’ll get the ranking boost. Now, the next task is how do you maximize the number of clicks you get on a video? YouTube gives out three main ingredients in search results. If you can optimize all three of these, half the battle is won. Or maybe most of it! Make your thumbnail stand out. Find out what the rest of the marketers are using and change your colour scheme, fonts and the overall look of the video to make it stand out. These thumbnails are created to fetch you more clicks when someone looks for those keywords on YouTube. Use colors that contrast with YouTube color scheme. Use non YouTube colors in your thumbnail. Thumbnails with text get more clicks. Write mini blog posts for your video descriptions. Keep them between 100-200 words. Sometimes these long descriptions help you pull in all the competitive keywords. This is one of the easiest ways to increase your click-through rate (it can boost it to 38% according to research. Just adding a bracket can increase your clicks by more than a third. You can use (Fast) (Now), etc. Include your target keyword once in the title and maximise your click-through rate. You can use compelling words in the title that also stir emotions. For instance, The MUST do’s, Here’s what YOU NEED…etc. You can also add the dateline; this tells your viewers that the content is still relevant. Let the description talk about the video compellingly using the relevant keywords. For description snippets, avoid using the website address there. Save that for the second half of the narrative. The description should tell your audience what the video is about, in just a few words. Video tags are as important as they used to be. Your video tags are designed to tell YouTube the content of your video. If you use too many tags, YouTube won’t understand what your video is about and it won’t rank it. You have to create highly specific tags. Target Keyword is your first tag. YouTube puts more weight on tags that appear early on. Alternative Versions of your main keyword also go a long way. You can do variations for your main keyword. When you write your main keyword into the YouTube search engine, it gives you all the other suggestions. Broad : Include one or two broad tags as your last set of tags. These tags should explain your overall videos or topics. These tags give YouTube more context about your video. How can you get your video to appear as a suggested video? When YouTube sees that some of your tags match the tags of a popular video, it automatically pops your video in suggestions. First check out the tags that the particular video uses. To see the tags you need to look at the Source Code of the page. Right Click on the page and click View Page Source. Look at the Keyword section of the page. The keywords that appear here are the tags. Copy the tags word by word. You need to play your video in different windows. Let it play completely. Do this multiple times. This will increase the watch time of your video and help in getting your video a better ranking. How many likes, share and views you get obviously affect your YouTube ranks. You can see everything in place, but if no one is watching your video or the reviews are not right, then there is no way you can get good rankings on YouTube. Share the video on your various social media profiles including Google+, Twitter, etc. First log into your YouTube analytics and go to audience retention. Search for a video that has done well. Look for audience retention peaks. Look at what that section had that made your video work. With YouTube rising to the second largest search engine on the Web, there’s no argument why YouTube Rankings matter. This is your chance to make your business grown by using simple tips that go a long way in establishing something strong. According to experts, “how to” searches on YouTube are growing exponentially. What are you waiting for?